Charles-François Daubigny (15 February 1817 – 19 February 1878) was one of the painters of the Barbizon school, and is considered an important precursor of Impressionism. Daubigny was born in Paris, into a family of painters and was taught the art by his father Edmond François Daubigny and his uncle, miniaturist Pierre Daubigny. Initially Daubigny painted in a traditional style, but this changed after 1843 when he settled in Barbizon to work outside in nature. 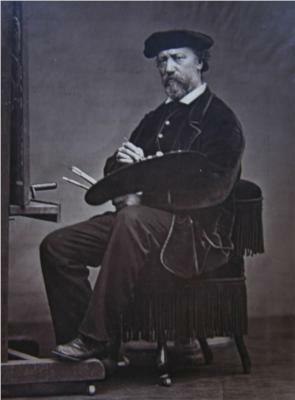 Even more important was his meeting with Camille Corot in 1852 in Optevoz (Isère). On his famous boat Botin, which he had turned into a studio, he painted along the Seine and Oise, often in the region around Auvers. From 1852 onward he came under the influence of Gustave Courbet. In 1866 Daubigny visited England, eventually returning because of the Franco-Prussian war in 1870. In London he met Claude Monet, and together they left for the Netherlands. Back in Auvers, he met Paul Cézanne, another important Impressionist. It is assumed that these younger painters were influenced by Daubigny. His most ambitious canvases are Springtime (1857), in the Louvre; Borde de la Cure, Morvan (1864); Villerville sur Mer (1864); Moonlight (1865); Auvers-sur-Oise (1868); and Return of the Flock (1878). He was named by the French government as an Officer of the Legion of Honor. Daubigny died in Paris. His remains are interred at cimetière du Père-Lachaise (division 24). His followers and pupils included his son Karl (who sometimes painted so well that his works are occasionally mistaken for those of his father), Achille Oudinot, Hippolyte Camille Delpy, Albert Charpin and Pierre Emmanuel Damoye. Banks of the Oise Charles-Francois Daubigny ? By the sea Charles-Francois Daubigny ? The Banks of the Thames at Eames Charles-Francois Daubigny ?